Solar radiation torques are reduced by the shadows cast by one part of the spacecraft on another. Shadowing reduces the total force and also shifts the center of pressure. The extent of shadowing is a function of the geometrical design of the spacecraft and the incident Sun angle. Examples of shadow modeling for DCSC II and AE-3 are given by Suttles and Beverly  and Gottlieb el al., . Although the shadow modeling for AE-3 was used to evaluate aerodynamic torque, the same method can be applied to solar radiation torque. The interaction of the upper atmosphere with a satellite's surface produces a torque about the center of mass. For spacecraft below approximately 400 km, the aerodynamic torque is the dominant environmental disturbance torque. where V is the unit vector in the direction of the translational velocity, V, of the surface element relative to the incident stream and p is the atmospheric density (Section 4.4). The parameter CD is the drag coefficient defined in Section 3.4 and js a function of the surface structure and the local angle of attack, arc cos (N-V) [Schaaf and Chambre, 1961]. For practical applications, CD may be set to 2.0 if no measured value is available. The first term in Eq. (17-57) is the torque due to the displacement of the spacecraft's center of pressure from the center of mass. The second term is the dissipation torque due to the spacecraft spin. For a spaoecraft in Earth orbit with w<£ Vq, the second term, is approximately four orders of magnitude smaller than the first and may be neglected. The first term in Eq. (17-57) is evaluated in the same manner as the solar pressure torque. The surface area of the satellite is decomposed into simple geometric shapes and the total aerodynamic force is calculated by integrating Eq. (17-54) over the individual shapes. Table 17-3 lists the aerodynamic force for some simple geometric figures. 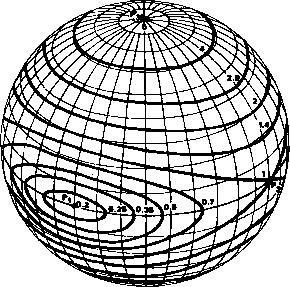 The total torque about the center of mass of the spacecraft is the vector sum of the individual torques calculated by the cross product of the vector distance from the spacecraft's center of mass to the center of pressure of the geometric shapes and the force acting on the component. Shadowing of one part of the spacecraft by another must also be considered in the torque evaluation. Because the aerodynamic torque increases as the spacecraft's altitude decreases, shadowing can be very important at low altitudes. The extent of shadowing is a function of the spacecraft's design and orientation relative to the velocity vector. Examples of shadowing models are given by Gottlieb, et al„  and Tidwell, . Magnetic disturbance torques result from the interaction between the spacecraft's residual magnetic field and the geomagnetic field. The primary sources of magnetic disturbance torques are (1) spacecraft magnetic moments, (2) eddy currents, and (3) hysteresis. Of these, the spacecraft's magnetic moment is usually the dominant source of disturbance torques. The spacecraft is usually designed of material selected to make disturbances from the other sources negligible. Bastow  and Droll and Iuler  provide a survey of the problems associated with minimizing the magnetic disturbances in spacecraft design and development. where « is the spacecraft's angular velocity vector and ke is a constant coefficient which depends on the spacecraft geometry and conductivity. Eddy currents are appreciable only in structural material that has a permeability nearly equal to that of free space. Table 17-4 lists values of ke for simple geometric figures. Tidwell  has outlined an alternative procedure for calculating the torque due to eddy current interaction which involves the evaluation of three different constant coefficients.